Dipolog City, ICM’s Dipolog Base headquarters, is a small, laid back but an economically thriving city. It is the Bottled Sardines Capital of the Philippines. “Tuloy” (sardines) are abundant in the seas of Dipolog and are available the whole year round. It is a small, oily fish rich in vitamins and minerals and an excellent source of Omega 3 fatty acids. Placed low in the food chain, it is free of mercury. Consuming sardines is good for the health! “Tuloy” (sardines) can be cooked in different ways. But in Dipolog, “kinillaw ug sinugbag tuloy” are uniquely “Dipolognon” dishes. “Kinilaw na tuloy” means fresh raw sardine salad. It is likened to “ceviche” in Western countries. The difference is that vinegar is the denaturing agent instead of citrus acid. Traditional “kinilaw” uses big fish like tuna while “kinilaw na tuloy” uses sardines. My dad taught me how to prepare this easy dish. 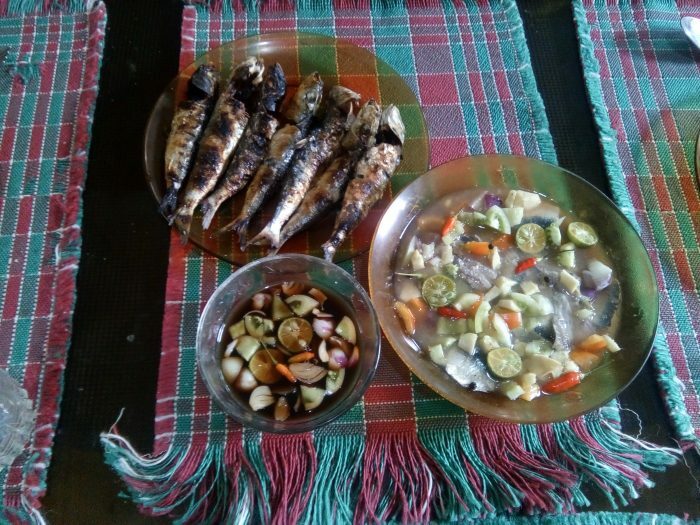 All you need are fresh sardines, coconut vinegar, ginger, onions, tomatoes, ‘kalamansi” (Philippine lime) or “biasong” (lemon), chili, salt and pepper to taste. Wash and clean the fish, remove the head, cut in half and debone it. Mince the other ingredients. Mix them all in a bowl. Marinate the fish until it turns white. “Kinilaw” renders a medley of flavors when eaten. Sour, spicy, citrusy tastes complement the fish’s natural flavor. It is refreshingly good and melts in your mouth. Perfect for an appetizer and even as a main dish with hot rice. “Sinugbang tuloy” means grilled sardines. Grilling is a universal way of cooking food and is so easy to do. All you need are fresh “tuloy” (sardines), salt, charcoal and a grill. After building a fire, wash and thoroughly clean the fish. Sprinkle salt on the fish and then grill them. The sardines’ natural oil will cook and make the fish flaky. It is best hot from the grill. Using you bare hands, eat it straight or dip it in a sauce of vinegar, soy sauce, “kalamansi” (Philippine lime) and chili. The mix will be sure to impress your taste buds! The flesh should be soft, not dry, with the natural taste of fish oil enhanced by salt. It should be sweet and not fishy. You can’t help but lick your fingers afterwards! Grilled sardines are best with a bowl of hot cooked rice on the side. These dishes should be cooked and served fresh, so you can’t find it in restaurants. “Kinilaw ug sinugbang tuloy” are always present at picnics and family gatherings. Sardines are so affordable when in season; they can be bought for as low as PHP5 (.10USD) a kilo. Everyone regardless of status in life enjoys these dishes. “Kinilaw and sinugbang tuloy” should definitely be on the “to taste” list when visiting Dipolog City. “Ali mangaon nata!” Come, let’s eat!